Caption slip reads: "Daily. Photographer: Richardson. Date: 1953-01-26. Reporter: Swaim. Assignment: Playhouse robbery. 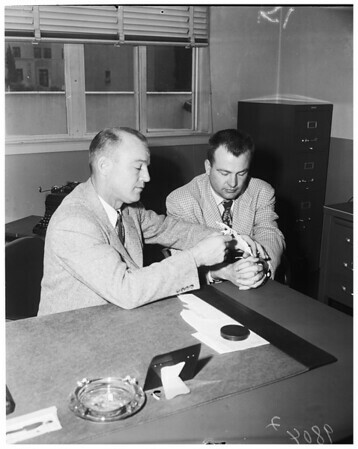 1: Detective Lawren Rittenhouse, Pasadena, interviewing George B. Hawes, 31, auditor and victim of Pasadena Playhouse robbery. Shown are tapes used by bandit in binding Hawes."